Repairing cracks in roadways is a costly and time-consuming job. So researchers have come up with an automated system to fill cracks in asphalt, which covers more ground in less time and could save money by extending the life of a road. 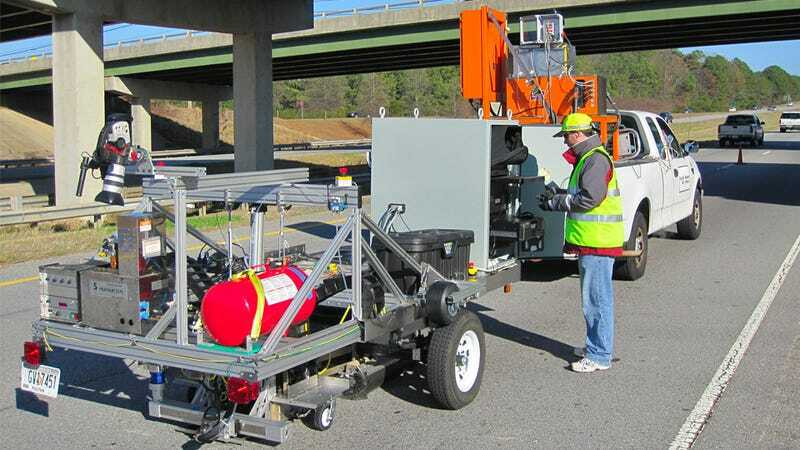 The new method is an automated pavement crack detection and refilling system developed by Jonathan Holmes and colleagues at the Georgia Tech Research Institute (GTRI). The device, which attaches to a vehicle like a trailer, uses a stereo camera and light-emitting diodes (LEDs) to detect cracks in the road. Once a crack is identified, it is sealed while the vehicle moves at a mere five kilometres per hour. GTRI research engineer Jonathan Holmes said that the system works like a dot matrix printer, which dispenses dots of ink onto a piece of paper that moves through a reel. In the case of the crack sealing system, the road is the moving sheet of paper and nozzles attached to the device fire sealant into the cracks. The device is able to identify more than 83 per cent of the cracks in the road with a vision system that uses red and green LED lights that spots cracks smaller than three millimetres wide. The cracks are photographed and detected within 100 milliseconds of being spotted by the cameras and are then sealed. The system has already been tested on a roadway in Georgia and in parking lots with cracked asphalt. Researchers are now fine-tuning the image processing software used to identify cracks and they plan on scaling up the device for use in a four metre wide section of road.